When you think of Ohio, you don’t immediately think of great outdoor adventures, but it’s a surprising state that gets along quite nicely without needing to be home to an iconic National Park. One place where wilderness and the outdoors are alive and well in Ohio is in the Cuyahoga Valley. This is home to the 11th most visited National Park in America, after all. One of the best ways to get around the Cuyahoga Valley national park is by bike, and the Ohio and Erie Canal Towpath Trail that winds along here is the best ride around. Taking advantage of the “Bike Aboard!” service of the Cuyahoga Valley Scenic Railway, you can get into Cuyahoga Valley National Park quite easily and cheaply at only $3 per ride. Once aboard, there are multiple stations to choose from to start and end your biking adventure. My adventure started by getting off the train in Brecksville and riding along the Towpath Trail towards Peninsula. With plenty of side trails and stops along the way, it was a more interesting trail than expected. The Towpath Trail passes farmlands, forests, lakes, and of course the Cuyahoga River. With camera at the ready, I found myself screeching to a stop on numerous occasions as the wildlife around here was quite impressive. I spotted snakes, birds, turtles, frogs and more. 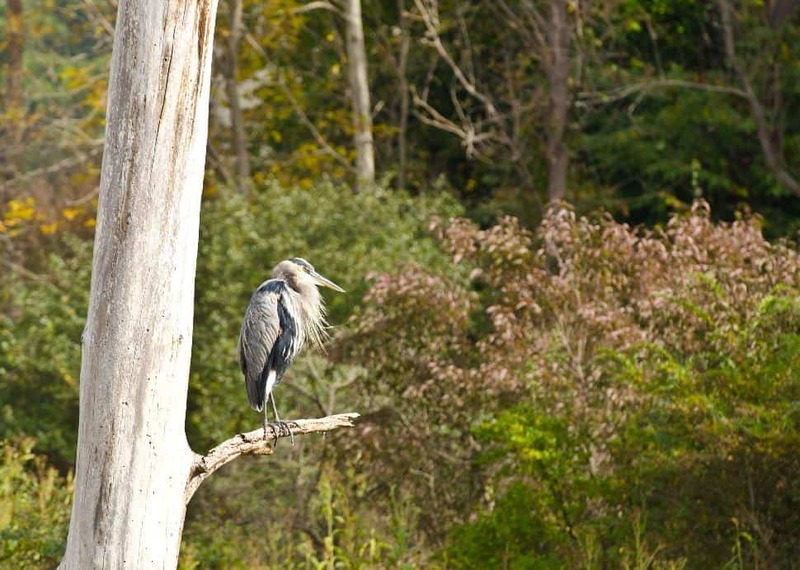 The first encounter was with an impressive Heron, taking a nap on a dead tree branch. He posed nicely for a few photos, before I got back on the bike and rode away. Within 2 minutes I had stopped again to check out three turtles sunning themselves on a log. I’m sure if I hadn’t put myself on a timed schedule I would have stopped to observe many more creatures along the bike ride, but I had a return ticket booked from Peninsula all the way to Rockside a couple of hours later and wanted to enjoy as much of the biking as possible. At certain areas along the way plaques are found alongside the trail, telling the natural and human history of the area. Near Peninsula, and just beyond, are a series of locks, now abandoned that bring the old milling history to life. The path itself, it largely flat and very well maintained. While this is the most scenic part of the Towpath Trail, running for nearly 20miles in the valley, it actually extends beyond Cuyahoga Valley National Park to both the north and south with Cleveland and Zoar as the ultimate end points. Crossing through a number of smaller towns along the way, it’s a great option for either a half day of biking or a weekend, multi-day trip, all within a short drive – or train ride - of Cleveland. Points of interest along the Cuyahoga valley portion of the trail include the 63ft high Brandywine Falls and the Beaver Marsh, both great spots to stop for a break or photos along the way. As for ending a ride in Peninsula, it helps to have a Winking Lizard Tavern right beside the trail and train tracks to fuel you up after a good day of riding! Curious to know more about the Towpath Trail and biking in Cuyahoga Valley National Park? Check out the links below!